Recently on a celebratory trip to France, the party gathered in the garden for a quick photo whilst waiting for the taxi. I had a flash in its hot shoe on my camera and a lovely sky behind the subjects. Unfortunately, I didn't have time to do a lot, but I will walk you through how to get such a shot. Remember, this is just a quick snapshot. For a proper shoot, I recommend planning and proper exposure as best is possible before editing. My results were a far cry from proper exposure. Get a nice exposure of the sky with your camera. You can do this with AV or TV mode. Remember however, if you're using flash, you'll want to be at 1/200th of a second, or if you have HSS (high speed sync) you can use that. Remember though, you'll lose light with from your flash with HSS. I put my flash on manual mode because I seemingly can't use automatic flashes (must remember to learn this one day) and fired some test shots to see how we were looking. Finally I ended up giving it all my flash had a full power. My historgram looked good, sky was exposed and I could see my subjects. In hindsight, I should have doubled my ISO to expose the subjects better and worry about the details of the sky in post processing, but I was on my third glass of bubbles. Let that be a lesson for you all. In short, check the result with your camera screen and historgram to ensure you've got something to work with in post. So, first things first, we need to expose the subjects more. Remember I said I should have doubled my ISO, well, let's do that (by increasing the overall exposure by 1 stop. I still think the exposure can go up, so I actually increased it by 1.43 stops in the final image. This exposes the subjects' faces properly, as that is the most important thing to expose correctly in this type of image. Next I pushed the shadows as much as I could. Remember, this image isn't fine art but a snapshot of a birthday party. I pushed them to 83% and the garden and the background start to show themselves. After this was done, it was a matter of adjusting the saturation and temperature to taste to get a nice warm evening feeling. Add a bit of contrast and we're getting somewhere. Next, I used a graduated filter on the sky to make it appear as I wanted and last, I added a bit of sharpness to bring out any extra detail I could find. And that's that. Final image above and below. A quick trip to Pernand Vergelesses, a quaint village in Burgundy, France was a welcome relief from the food and drink of Norway. A family arrangement was taking place and I had a long weekend to catch up, eat (mostly cheese), drink and be merry. Fortunately the weather was favourable and the colours of autumn were on display in and around the village, which is surrounded by some of what I believe to be the greatest vineyards in the world. But enough of the wine talk. This is a photo blog. From a photography point of view, the images could have been a bit sharper and my focal point a bit better selected, mais c'est la vie. J'etais en vacances. Remember, when taking landscape pictures and wanting large depth of field, use a higher aperture, say f/9. Also, keep in mind that your focal point determines how much of the field in front of the focal point is in focus. There are plenty of focal point calculators online. Make the most of autumn, whilst you can: winter's coming (unless you're lucky enough to be in the Southern Hemisphere with those lovely stellar views). 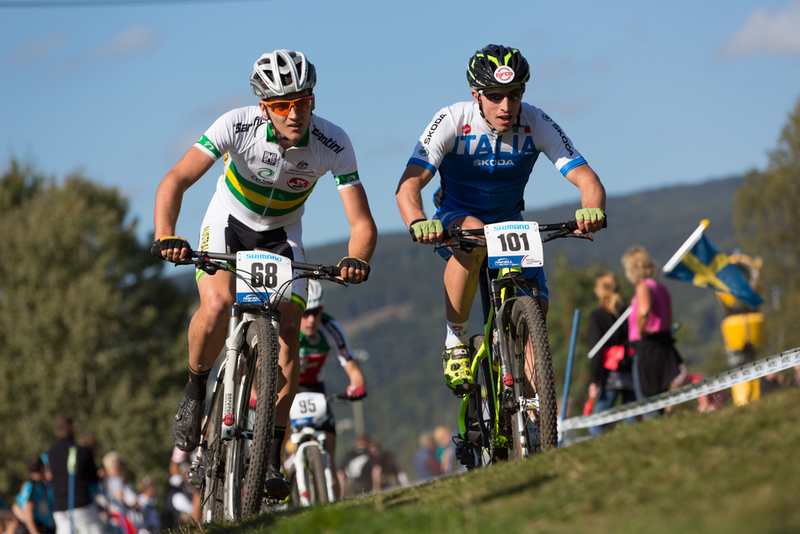 Photos from Men and Women's MTB XC World Championships in gallery below. 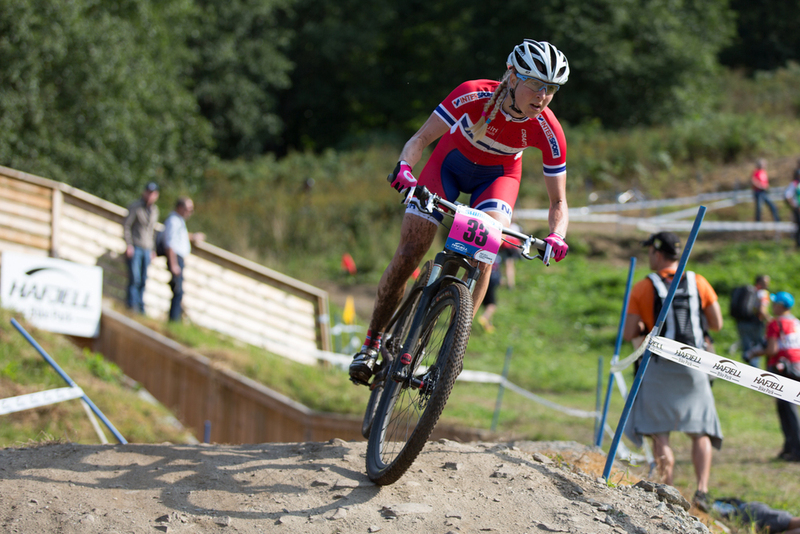 After much anticipation, the UCI 2014 Downhill World Championships got underway at Hafjell, Norway at 12:15pm CET, today, September 7th, 2014. First out of the gates in the elite category were the women, where the favourite was Rachel Atherton. Norway flying, if only temporarily. Straight out of the gates the riders were faced with huge jumps, which they took on with great gusto and skill. Immediately after the jumps the riders ploughed into the first of several rough sections of forest laden with rocks of varying sizes; from small to large and intimidating and slippery roots seemingly randomly woven through the track. 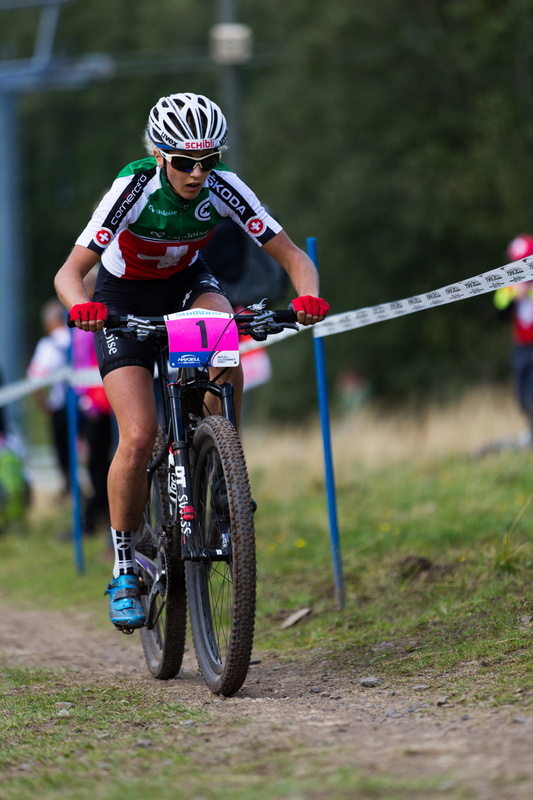 The women's race was won by Manon Carpenter of GB, followed by Rachel Atherton and Tawny Seagrave, both also of GB. Well done girls! The mens race was fast. Very fast. 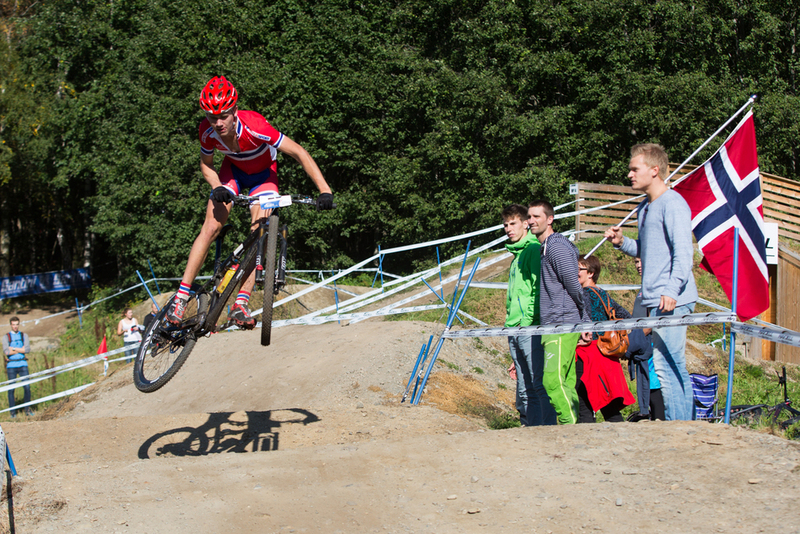 The male juniors had already completed the track in the same time as the elite men did last year. The track was dry and extremely loose with a thin layer of fine dust sprinkled on top like icing on a cake. Come the bottom section of the course, the riders let go of the brakes and flew over the few obstacles remaining before the last forest section. To aid in the no brakes game, berms slinged riders towards the open ski slopes of Hafjell. Just before the open section, the riders readied for a steep, off-camber turn into the speed trap. Riders were, as was Mick Hannah above, often clocked at over 77 km/h. Sam Hill emerging from the forest after his crash. 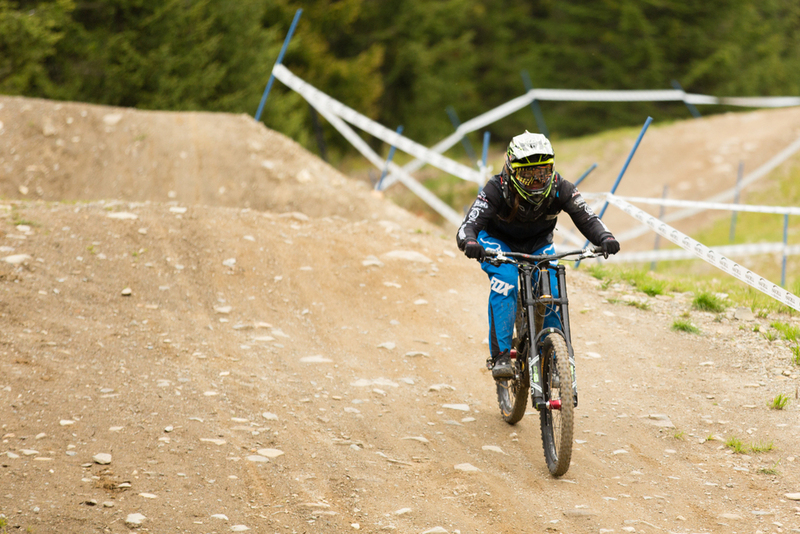 Sam HIll of Australia, above and below, was 3 seconds up on the competition before he crashed in the final technical forest section. That didn't stop him flying out the forest before reading for the final jump and push to the finish. Unfortunately for Josh Brycleand, who was 1.4 seconds up before the above jump, the final jump was hit with too much speed, and he landed past the downward slope onto a flatish surface and appeared to break his ankle. He still finished in second place, but didn't stand on the podium as he was whisked away to the hospital. Here's to a speedy recovery, Josh! It was wonderful to see so many spectators today. This gives me hope that Hafjell Bike Park will remain open and with any luck, we'll see the World Cup and World Championships back here soon! Congratulations to Gee Atherton of GB who takes yet another World Championships. A cracking ride! Racing has finally begun for the elite professionals taking part in the downhill and cross country racing this week in Hafjell. Today saw the largest ever field for the World Championships Team Relay. Current champions Italy had fierce competition along side them and the racing was fierce from the get go. Italy lead the field just before the first service pit, as illustrated by Italy's Luca Bradiot above. (On a side note, I was fishing with his brother and fellow professional racer, Daniele a few nights previous, but he, like me caught nothing but algae). Denmark, Sweden and South Africa hot on Italy's heels. Just behind Italy were Denmark, Sweden and South Africa and were gaining ground. I don't know what happened to Luca Bradiot on his lap, but he finished his lap well behind the field. My guess is that he suffered a mechanical as he didn't look as if he had crashed when he rode past. Daniel McConnel was Australia's first rider in the relay and he kept pace with the leaders for the duration of his lap, coming only a few places down before handing over to a team-mate. Flags are meant for waving! Josh Bryceland (L) and Steve Peat (R). Both World Cup Downhill winners and Steve, a World Champion. 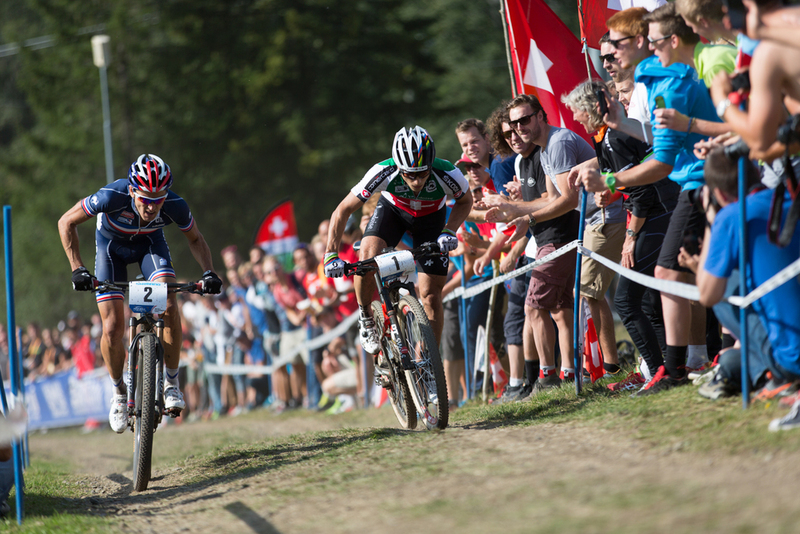 The cross-country course is a mixture of technial, bike park, fierce climbing and some tricky descents. Below is Daniel McConnel navigating the start of a set of technical descents. Not long after this section, things start to get very tricky. Sweden lead the race for the first lap, but soon someone else would take the lead. If only they could have kept it! It's a lot steeper than it looks. Notice the angle at which the men are standing to the right. The Australian above was the second of the four riders and at this point, he, and hence his team were leading the race. By the finish they were not to be so fortunate. Come the end of the race, the French had taken the lead and one of their riders, pictured above rode the tricky descents with some panache. About 12 minutes after this picture, they crossed the line victorious. Trout. That was the plan for dinner. All I had to do was cast my line into the lake and pull up a trout big enough to feed one. I'd even bought a nice bottle of white to go with the catch of the day. Well, it's been four days of trying to catch a trout both in mountain lakes and a river leading into Norway's largest lake. 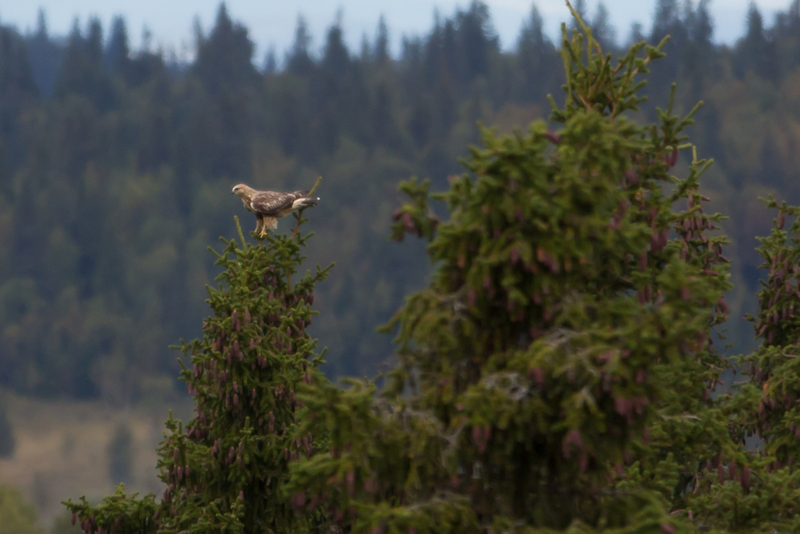 On the way down the mountain I happened upon some birdwatchers that I met the other day when I saw a Pallid Harrier, which is only the second time one has been recorded in Norway. The two twitchers were on the lookout for the harrier again, but it didn't show. As I drove off, I noticed a large bird being chased (playing?) with another birds. Turns out it is a Rough-Legged Buzzard and what I think is a Raven. I'd never seen a Rough-Legged Harrier so I considered that a tick in the box, even if the trout still alluded me. The harrier eventually landed on a tree not too far off, and after battling some sheep for a good place to stand, I managed to get the below picture before it flew off again. A tree with a view. So, after four days of no trout, it's mountain biking tomorrow. Maybe a day of that and my luck will change for the better. They're an odd creature, ikke sant? 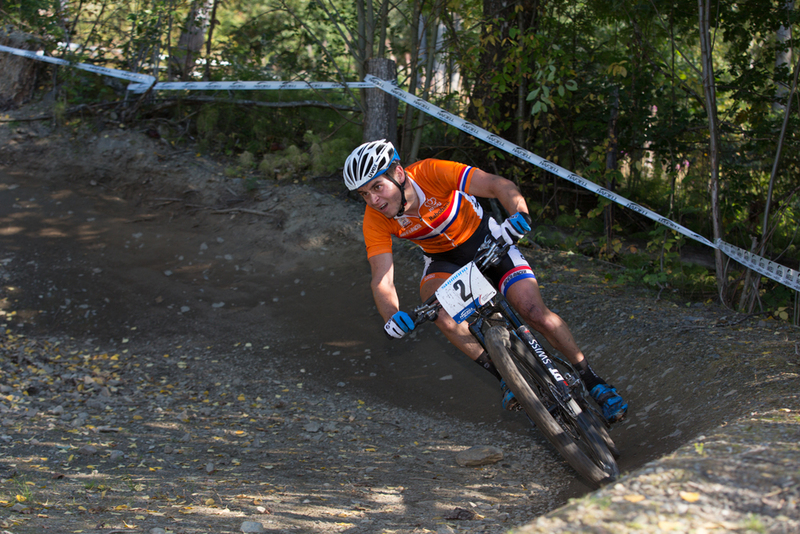 The 2014 World Mountain Biking Champsionships for downhill, cross country and trials start this week. Given that it's happening in my backgarden, so to speak, the week has been taken out of the calendar and it's time to watch the best riders in the world show amateurs like me how it's down. Not a lot happened today given we're still seven days out from the downhill, but riders were seen having fun nonetheless and studying there lines. Sam Hill was spending a lot of time in the first forest section, whilst Tracey Hannah was perusing her options in the trickiest forest section. Showing 2012 Tour de France winner, Bradley Wiggins, that "descending like a girl" isn't the best choice of words to describe his meagre efforts in the 2013 Giro, the young women below was absolutely belting it out of the start gate before tearing into the first of three forest sections. Girls can ride bikes, Brad. Eva had joined me for the weekend which was awfully nice and yesterday was spent trecking in the back country beyond Øyer. We tried for an hour or so to catch trout but were out of luck. I spent approximately four hours fishing today but again, my luck ran dry. Eva on the other hand hit the jackpot with oodles of cranberries to be found and whisked away to await their collective fate in a jam jar in my kitchen. With any luck, this will be a top notch week of riding, racing and hopefully, some trout! Hitting the ripe old age of 32 I've found that more and more of my friends have children of their own, and several of them are now running around and causing mayhem all around them. Given the prevalance of digital cameras and camera phones, there is no shortage of pics of the little ones. However, not all of these pictures are keepers in my opinion. One a recent trip to Finland with a group of friends, I asked if I could take some snaps of one of the little ones whilst she generally ran amok in the local flora. Kids tend to be fast and have a mind of their own. Ask them to smile; good luck! Ask them to stay still and they'll run a million miles. Use continual focus and a snappy shutter speed, say 1/250 or 1/400 if you can get away with it. There best piece of advice I can offer however and it is quite simple is: photograph children at their own eyeline. I would wager that by doing this, whether they're smiling or not that nine times out of 10 that the picture will have something that a picture taken from the height of an adult will not. By shooting at their eyeline, the picture, to me anyway, feels more personable and shows the world from the child's perspective. It's also fun to get down so low and perceive the world from down there. It's awfully big from that perspective. This advice is not to say that you must always shoot from such a perspective, as there are plenty of interesting angles to capture depending on what the little terrors are up to, but in general if you're not shooting from down low then by doing so you can make a little stumble as in below, look a bit more like an action shot. And a big thanks to the parents of this little one for letting me use the images here. All names redacted for the sakes of our subject's privacy.